This page Literary fiction is part of the literature series. It can be argued that all novels, no matter how "literary", also fall within the bounds of one or more genres. Thus Jane Austen's Pride and Prejudice is a romance; Fyodor Dostoyevsky's Crime and Punishment is a psychological thriller; and James Joyce's A Portrait of the Artist as a Young Man is a coming-of-age story. These novels would usually be stocked in the general or possibly the classics section of a bookstore. Indeed, many works now regarded as literary classics were originally written as genre novels. Literary fiction is a term principally used for certain fictional works that claim literary merit. The term came into common usage around 1970, principally to distinguish 'serious' fiction (that is, work with claims to literary merit) from the many types of genre fiction and popular fiction. 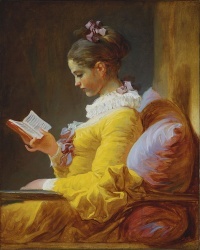 In broad terms, literary fiction focuses more on style, psychological depth, and character, whereas mainstream commercial fiction (the 'pageturner') focuses more on narrative and plot. Despite the fact that all genres have works that are well written, those works are generally not considered literary fiction. To be considered literary, a work usually must be "critically acclaimed" and "serious". Literary fiction (a.k.a. mainstream fiction) is usually contrasted with paraliterary fiction (e.g., popular, commercial, or genre fiction). This contrast between these two subsets of fiction is highly controversial amongst critics and scholars who study literature. Literary fiction includes works written as short story, novella, novel and novel sequence. Of these, the novella is relatively uncommon in English literature, and more important in German literature or Russian literature. In the world of comic writing, graphic novels are sometimes considered literary fiction, as represented by a work such as The Extraordinary Adventures of Adèle Blanc-Sec. The distinction has its subjective side, as it is impossible to draw an objective line between literary genres (for example, note that magic realism tends to be considered literary, while most fantasy writing is not). This is, however, no different than in any other medium. Genres tend to flow into one another and there are always exceptions. For literary fiction, the dividing line cannot be accurately drawn on the basis of content alone, and has to include style as a consideration. Literary prizes usually concern themselves with literary fiction, and their shortlists can give a working definition. Literary magazines, especially those affiliated with universities or ones considered for selection of anthologies by groups like the Pushcart Prize or O. Henry Awards, typically limit their fiction. A "no genre fiction" rule for submissions is common. It has become a commonplace that 'literary fiction' is in itself just another genre. This accords with the marketing practices now general in the book trade. It may also be taken to be the latest version of the death of the novel debate that has run from 1950, and reflects the importance of the novel as it replaced poetry as the central literary form in Western Europe and North America from the 1930s. However, "literary fiction" does not fit the general definition of a "genre" as it lacks the cohesion of genres like "westerns" or "romance" and lacks any kind of genre conventions. One would be hard pressed to come up with a list of genre conventions that would also apply historically, to include everything from the surrealist prose of Beckett to the punchy prose of Hemingway to the works of Victorian England. Samuel R. Delany noted that the "literary genres might be characterized as the 'tyranny of the subject'" because of the focus on the "subject, the self, [and] psychology". On the other hand, Mort Castle suggests that literary fiction is composed of three genres: literature (i.e., classics), realism, and postmodernist fiction. Other authors struggle with the expectations of the literary 'genre'. In an interview by Lev Grossman for Time magazine, John Updike lamented that "the category of 'literary fiction' has sprung up recently to torment people like me who just set out to write books, and if anybody wanted to read them, terrific, the more the merrier. But now, no, I'm a genre writer of a sort. I write literary fiction, which is like spy fiction or chick lit". Likewise, on The Charlie Rose Show, he shared that he felt this term, when applied to his work, greatly limited him and his expectations of what might come of his writing, and so does not really like it. He said that all his works are literary simply because "they are written in words". Unless indicated otherwise, the text in this article is either based on Wikipedia article "Literary fiction" or another language Wikipedia page thereof used under the terms of the GNU Free Documentation License; or on original research by Jahsonic and friends. See Art and Popular Culture's copyright notice. This page was last modified 14:04, 13 December 2017.